If you don’t go to Biker Barre, you might not have met co-owner Katie Fouts. She’s a badass on (and off) the bike. And the woman can dance, if her spin room moves are any indication. I suspect she teeters on the edge of crazy fun to go out on the town with. She’s inspiring. (I’m a sucker for the whole “I was unhappy in my previous career and made a complete change” storyline.) She’s energetic, smart, and gorgeous. I was most honored when Katie approached me a few weeks ago and asked if she could engage my services in finding her a gown (make that two) for Inaugural festivities in January. By way of an aside, let me note that Katie plans to attend the balls regardless of who wins the presidency, though she assures me she does have a preference as to who emerges victorious. Attending an Inaugural ball just happens to be something on her DC Bucket List. Initially, we met to discuss strategy, over wine of course. 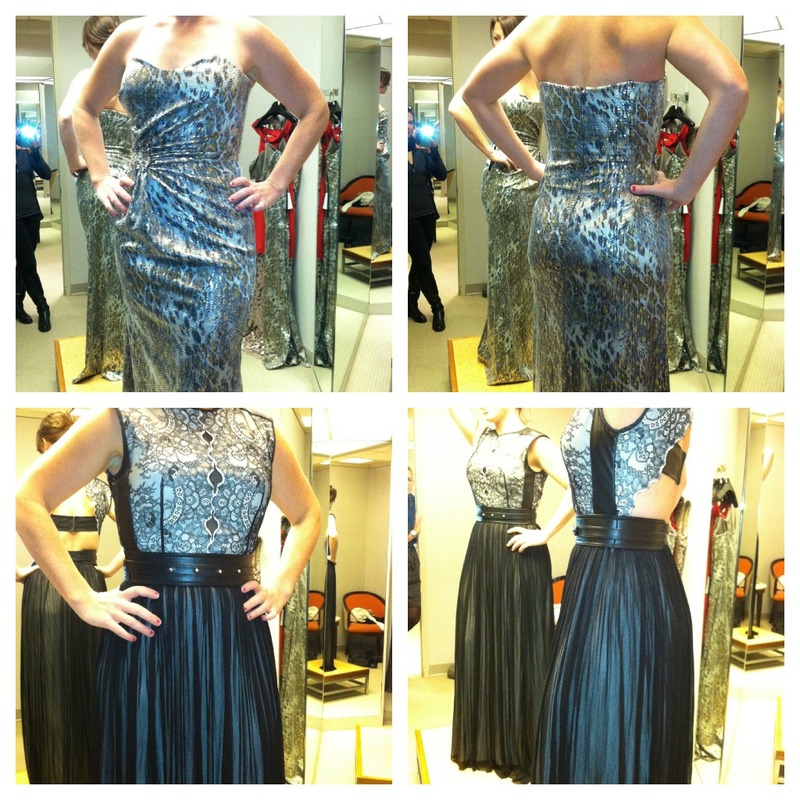 We decided she needs a black dress for Inauguration Eve and a spectacular dress for the big night. She set a budget. She started a Pinterest board, Cinderella Time. And we scheduled our initial date to shop. We hit two stores: Neiman Marcus and Saks. At Neiman, I suggested we look at every dress. I pulled gowns we had pinned and gowns we were unsure of on the hanger because I wanted to push her boundaries. Of the ten gown we brought into the dressing room, the first three I suggested she try emerged as favorites. I will hold back on sharing a photo of the top contender for now, as we want to see her in a different style by the same designer. (We may stage our own little public opinion poll.) While we loved the David Meister Animal-Print Gown on her (pictured at the top) I feared that she’d be yanking up the strapless bodice all night and that the sequins would chafe her underarms. We also loved a Catherine Dean gown (pictured below) for its edgy factor, but it was way over budget. (I don’t normally endorse trying on dresses over your budget but in this case, we wanted to try something out of the ordinary.) Both dresses were flattering, but neither was our favorite. Our Inaugural Gown Pursuit continues. Stay tuned for the next update. In the meantime, if you can introduce Katie to an eligible bachelor who’s tall, hunky and able to match her dance moves step for step, maybe she’ll comp you a spin class. Chelsea, you are a pro! I love shopping. And I mean… I’m REALLY good at it. But finding the perfect thing for an important event like this is hard — and it’s not like I buy formal gowns all the time. Not only were you insanely helpful (keeping me on budget, knowing the stores and designers, making fantastic suggestions, teaching me about fabrics and styles that would work well for me and the event), but you were SO MUCH FUN to shop with.